Deep red. Musky, spice-tinged cherry, black raspberry and floral scents, joined by subtle, slowly emerging cola and herb nuances. Offers bitter cherry and candied licorice flavors, along with subtle menthol, cola and peppery spice flavors that unfurl slowly on the back half. Juicy acidity lends spine and firmness to the very long, penetrating finish, which features youthfully chewy tannins and a touch of cherry pit. This wine’s structure should make it a worthy cellar candidate. The 2014 Vintage was warm, hot and dry and this makes for easy to drink wines right out of the chute as ripeness makes people happy and with bigger wines, better texture is available. 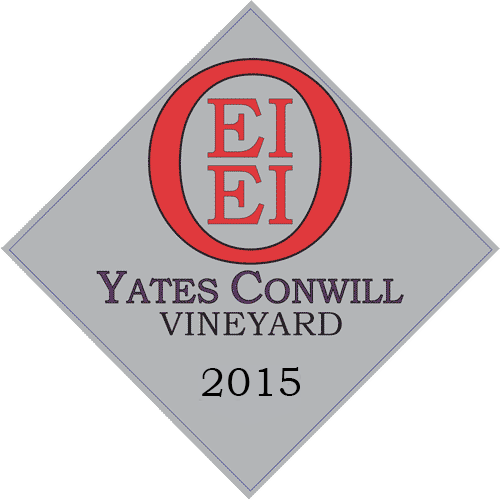 This Yates Conwill Vineyard Pinot noir has all of these attributes in spades! South – Southeast facing site just west of my farm just west of Carlton. Farmed to “bonsai garden” perfection by the gang at Results Partners, this is a site that I am happy to be affiliated with for over eight years now. Fruit, year in and year out is always clean and ferments without incident. Warm or cool vintage the “Ridge Terroir” shines through. Sandalwood right off the bat with a little coaxing via a swirl or three. Poached peaches sprinkled with cinnamon and a hint of Bayer orange baby aspirin. With a few days of air, that is correct, a few days, a plum compote followed by mincemeat pie is present. Over the next few days the wine evolves showing fruit and earth: muddled cherries, alfalfa, roasted plums and morel mushrooms. Now, on the evening of the FIFTH DAY all aromas are all there: starting with violets, freshly sliced black plums, peach skin, orange pith and almond butter. Give the glass a big swirl and then wait… wait for another minute… THEN go back to the glass and inhale: wild strawberries! Rarely do I ever get strawberries in my Pinots but it is here in this one! Amazing aromatics. You could spend an inordinate amount of time just breathing in this wine as it is always changing, albeit slowly, it is changing and evolving, because it is real wine. Once imbibed an explosion of blueberries with a fresh squeeze of lemon is obvious. A smooth, mouth enveloping wash shows more French Green Plum Tart followed by a raisin cinnamon bagel toasted and almost burnt to where the raisins are starting to caramelize. Think perfectly aged Barolo without the aggressive attack. How did this happen? Step away for a while then come back to experience smashed raspberries with diced kumquat. How weirdly satisfying is that combination? More patience reveals blackberries, wild plums, sous bois (forest floor) then caramelized plums, dusty raspberries, salmonberries, black currants soaked in Marc tossed over ripe Epoisses cheese and spread over a crusty baguette sitting on a large piece of slate. This is living! Entry gives you the desired big, rich and bold up front then an ethereal mid-palate weight, almost weightless, is followed by a complex light and lively finish. Perfectly balanced between the three-legged stool of Fruit, Acid and Tannin as alcohol is almost imperceptible. Even the astringency is not astringent, it is perfect. On second thought, I might not even sell this wine. Aromatics: Five spice and sandalwood. Caramel chocolate. Luminescent qualities of red fruit. Poached peach. Cinnamon. Orange Baby Aspirin. Plum compote. “Isn’t there some violet in this one?” Mince pie at Christmas. Baked slate. I’m getting the sea salt breeze. Sneaky good. Backbone of the fish. Like a potato chip fish. Baked Aji. Finish: Cornucopia of flavors. Sweet, tart and savory: onions within beef stew. Salty tangy. “Ume is where it’s at!” Clean. Hints of blackboard dust. Full circle: baked slate.